I whipped up a taggie blanket for a friend. I am in love with the fabric. 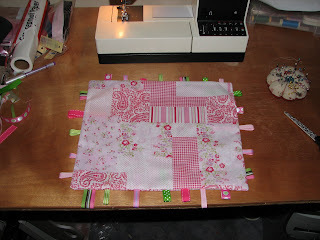 I would love to say I patch work quilted it but alas I did not LOL. It was dead easy to do although next time I think I will just do a pressed seam and top stitch rather than sew and turn it out and blind stitche the opening, or I could just make the opening smaller. Also I think I might use a fleece as a backing, it will make it a bit thicker and more cozy. I also want to have a go at making a pettiskirts! They are just the most adorable skirts. On the Lilypad front, I FINALLY sold my first froggy!!!! I've been doing some design work, here is what the client chose, a very elegany black, pink and white desgin. omg! the frocks look so lovely!